Coney Island is a neighborhood of attractions but right now nothing is bigger than Joey Chestnut. Everyone wants a piece of the World’s Greatest Eater. Even carnival workers who scream out as he walks by: "Did you win the hot dog eating contest?" asks one. "You did? 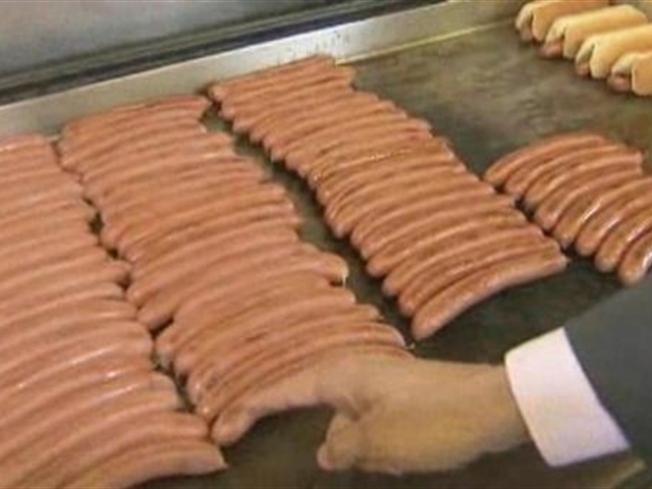 Congratulations"
And this July 4th he will defend his title at the annual Nathan's Famous Hot Dog Eating Contest. "The way I see it, I love to eat more than anybody,” said Chestnut. 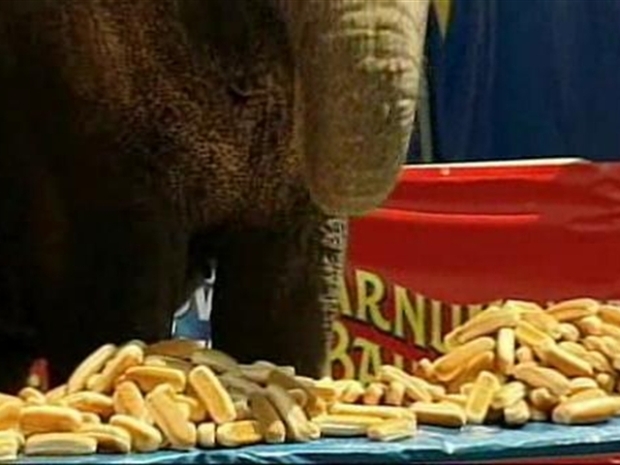 Three Ringling Bros. elephants competed in a bun-eating contest against three human Major League Eaters at Coney Island. After six minutes, the elephants won for the second time in a row. They ate 41 dozen buns versus 15 dozen buns consumed by the men. That means intense training. On Thursday he started fasting to build an appetite no human can match. "No solid food,” said Chestnut. “I'm gonna have some milk some coffee, lots of water, keep the muscles stretched loose, work all the hot dogs through my system [and] make sure the day of the contest I'm absolutely empty." Last year Chestnut broke the hot dog eating record. He ate 68 hot dogs in 10 minutes. This year he hopes to break that record eating 70 hot dogs in the same amount of time. Chestnut shared on of his secrets: mind over matter. "I'm ignoring any feeling of full any feeling of pain any feeling of tired," says Chestnut. But he doesn't take his health lightly. "I go to the doctor every four months to get my blood work done to make sure everything is working right," said Chestnut. Every competition needs drama and this year Chestnut's nemesis Takeru Kobayashi (the former champion) announced he's sitting out. "It's in my head a little bit but I'm not letting it affect me negatively," said Chestnut of Kobayashi's bow out ( although he may still compete). "I'm using that to motivate me if he is playing head games I'm gonna show him when he comes here that I'm gonna blow him away."